I’ve loved this series from the first book, and we’re finally in the wrap up. Its got some great secondary characters, as well as the gorgeous Gabriel and Rowan, his Promise. 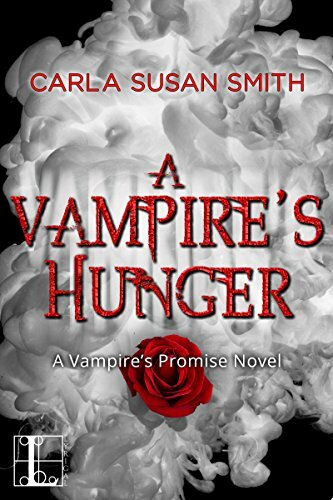 Its been interesting reading, Carla has taken the usual vampire formats but given them a very different beginning, and some additions to the Originals such as a Promise, a kind of Soul Mate I guess, and a ….darn, can’t recall the exact word..a kind of steward, someone who’s always with the vampire, looking after him, helping him do what’s necessary. Rowan is of course, Gabriel’s Promise, they’ve met through many lifetimes but this is the first time Rowan has recognised him, and been able to take up her role. Its quite complex some of the rules surrounding these guys. So once more Rowan’s in trouble, giving in to her friend’s pleading to keep her baby safe she has got herself and Gabriel in a world of problems. She got entangled with a Demon in book two, has been trying to find a way out ever since, but after she made Gabriel vow to be the baby’s protector she opened up a way for the Demon to take her from Gabriel in time. Then there’s Aleksei, who desperately needs her help at the start of this book, but doing so means she breaks a trust with Gabriel. She can’t just let him die though…he and Anazstazia are good friends of her and Gabriel. She gets another visit from the Demon, taunting her and leaving her a present, and that really infuriates Gabriel. I love this phrase right at the start “some quality time in his sarcophagus was needed” – it just sums up the relationship between Rowan and Gabriel where the abnormal, such as hours in a sarcophagus, becomes normal. Its all action, lots of planning, murders, drama, and the usual mix ups that Rowan finds herself in. Its the final book though, so all the things that have been opened up in earlier books are now coming to a head, and the way they get resolved s very satisfying – except for the Bridal Chain stuff. For me that wasn’t necessary, seemed to be adding some sexual inferences just for the sake of making the story a little more risqué. It wasn’t needed and had a bit of the “ick” factor for me. Just didn’t feel as though it matched the rest of the novels, dumbed the story down a bit…Still, that’s just my view and its a small part of the overall so though it irritated me it didn’t spoil the story. I’ve loved these four books, been a fun journey and a very satisfying ending, with this time of Rowan and Gabriel’s lives wrapped up. Of course there’s still the possibility of more from the story, as they start this new phase in their life. With vampires there’s no such thing as an actual ending, the story always continues when some are power hungry, and the Demons always looking for an opening. The story isn’t static, just this part of it that’s finished, as with real life, things carry on behind this tale and I can see the potential for more books from this world. Stars: Five, a great finish, fun drama and a very satisfying ending.